Last week Fear The Walking Dead returned with a (semi)crossover connecting the spin-off show to its predecessor The Walking Dead with fan favorite Morgan leaving Alexandria and heading west. In the aftermath of the war against The Saviors, Morgan was fed up with people and felt that he was better off alone. The inaugural episode followed him as he walked, ran, drove, and walked some more until he came across some new faces. His newfound Texas friends include John, a cowboy searching for his long-lost love, and also Al, probably the last journalist in the apocalypse who wants to understand people via interviews with her video camera (which still has power somehow). Just like on the East and West Coasts, Texas is a part of the zombie apocalypse, so the three have to deal with zombies, as well as people. While Morgan doesn’t want to be with them, he goes with them, until they get caught slipping by some people: Alicia, Nick, Luciana, and Strand. While we thought the latest episode of Fear The Walking Dead would show us the aftermath of the dam blowing up with their confrontation with the Proctors, we did go back in time. We get a bold “Before” on the screen as we see that the Clarks have survived the dam and were now holed up in an abandoned baseball stadium. Their new home is aptly named “The Diamond,” where they have been living there for a year. Everything seems nice and comfortable. They have cows, crops, coffee, even maple syrup, and life doesn’t seem too difficult for the group. Their community has more than 40 people and they have just taken in a new stray. A young girl named Charlie has just joined them. Charlie seems to have some shell shock as she’s been separated from her family. Madison, being the leader as well as maternal, tries to get Charlie to open up about her missing family. While Charlie doesn’t say too much as to what happened to her family, she points them in the right direction. Madison wants to launch a rescue operation for Charlie’s family. Luciana, Madison, Alicia, and Madison go into a nearby town, even though there’s a danger as it’s out of radio range. Nick isn’t ready to leave the safe refuse of The Diamond as he’s still dealing with the trauma of the dam exploding. As they head into the town, it’s completely abandoned. All supplies have been picked clean. Even the dead aren’t around. The spray-painted flag mystery continues as there’s one with “457” there. Madison finds one survivor named Naomi, who hold her at gunpoint. Naomi has been through hell and is untrusting. 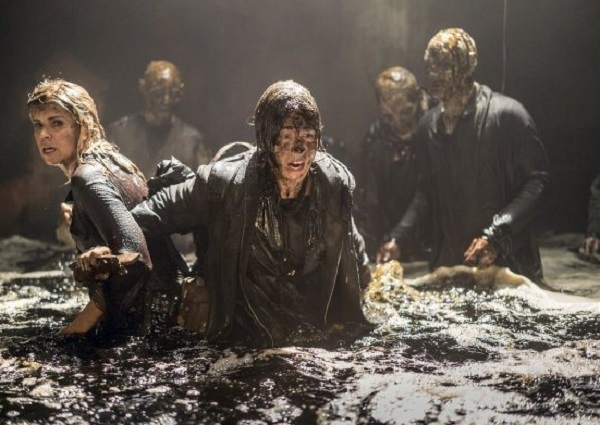 Even though everyone gives her breathing space and tells her that they are good people, she’s hesitant and ends up falling through an oil silo filled with zombies. Madison decides to jump in to save Naomi, which convinces her to join them. Naomi’s happiness is short-lived as the next night the stadium has a confrontation with a new group of bad guys. Surrounding the stadium, these bad guys already know the fact that weevils have destroyed most of their crops, they even know Nick by name. Turns out, they have a spy. Little sweet Charlie was really not separated from her family, but she’s been with this group. Their leader Mel simply waits in front of the stadium in a lawn chair and cracks open a beer. 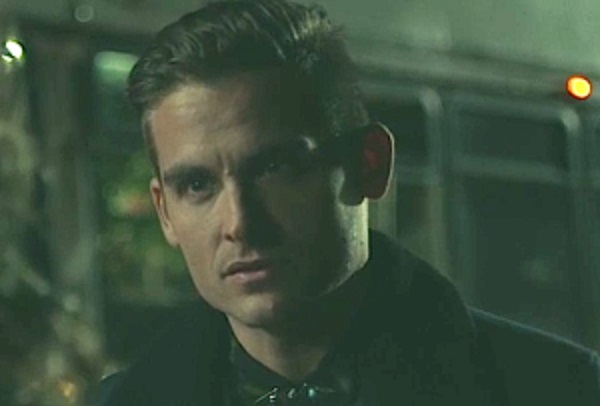 Madison confronts the new enemy who tells her about Charlie’s betrayal, and reveals that their crops would die and they will need to leave as that’s the “natural cycle.” He doesn’t threaten Madison, just tells her that’s the way it is. Flash forward to the present with them taking Morgan and his new friends hostage. They think that Morgan and his group are with “The Vultures.” They did have one of the flags which they capture on their trip, but they assure them that they are not. They order their new captives to prove it. After not having them in the first episode, it’s good to have the Clarks back on the show. When we last left them, the dam exploded and it wasn’t clear who would survive. All we saw was Madison survive. It’s clear that she got her bearings and saved her family. 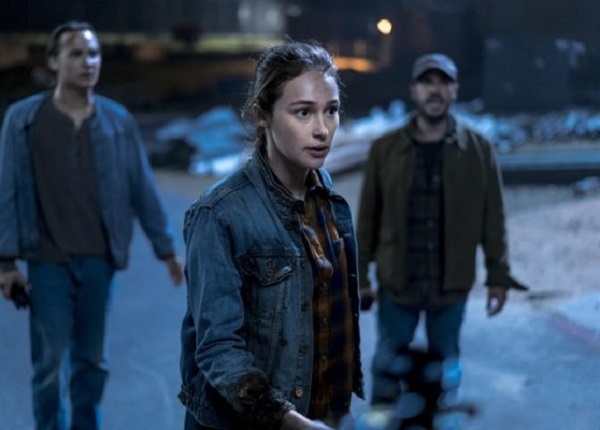 Towards the ends of last season, Alicia made the decision to go out on her own away from her family, but it’s clear that once they were reunited, their once again back to the tight-knit family they need to be in order to survive the apocalypse. While it looks like their community is no longer together at the current time, it looks like Strand was getting ready to have a boyfriend, which is good for LGBTQ representation. Although Strand previously betrayed the group, Madison took him back in and even he doesn’t understand why she did. Madison sees the good in people, no matter what they have done. To remind himself not to stray off again, Strand holds a piece of the concrete of the dam as a reminder to be good. This episode seems to introduce the new bad guys. While we are used to The Saviors from The Walking Dead, who rule through terror and violence, The Vultures seem to be the exact opposite. They are trying to survive, but they aren’t threatening their enemies. They don’t seem to have a lot of weapons, but have found a way to use music to control the zombies as evidenced by them corralling zombies, which could then be used for future purposes, almost weaponizing them. This is similar to how The Whisperers did in the comics. They don’t seem to have an endgame at this point, but they are just moving from community to community to starve people out. They do let people they conquer to join them, so they might not be 100% evil, just incredibly desperate. We didn’t get to see the aftermath of the dam explosion. While we got a flashback, it would have been a little better if we got to see Madison have to find her family, confront Strad, and find the new community. Instead, we just find them, after all, is well. Well, all isn’t well for one person. Nick, who is the most fearless of the group has become a shell of himself. He doesn’t even want to leave The Diamond as he’s afraid to go outside. It just seems so unlike Nick. The zombie well was good! We got to see Naomi and Madison fight off some zombies as they were stuck in the oil well surrounded by a bunch of the undead. There was even a fakeout where Alicia thought her mother turned into a zombie as you really couldn’t tell with her being covered in oil, only for it to be Madison. Despite humans being a big problem, zombies are still a big deal. Next week, the gang takes Morgan and the newbies hostage to unravel the mystery of the Vultures and their flags.